If you are not a fan of miniature and toy sized lapdogs, but you are also not too keen on the gigantic dog breeds, it is a good idea to opt for one of the many amazing medium dog breeds instead. Medium sized dogs can live in both small and big homes. They are usually easy to travel with and can become perfect pets if you choose the appropriate breed and dog. The different breeds all have unique and very specific features, characters, requirements and other particularities which you should know before adding a new four-legged friend to your family and home. Here are some of the most popular and other not-so-popular medium sized dog breeds and the basic facts you need to know about each of them. This is an Australian sheep dog which was bred to be smart, energetic and independent enough to guard herds of sheep all day and all night long in harsh warm and dry conditions without the need of too much supervision. As you can imagine, these dogs are pretty easy to train and are capable of learning various tricks as well as performing work such as rescues, nose work, sports, service dog duties, and others. The Kelpie is a highly energetic dog which is suitable for owners who love the outdoors and who love staying active. The dogs from this medium-sized breed reach a height of about 17 inches at the shoulder and have a lifespan of 11 to 15 years. They are happy, loyal and devoted to duty and have a natural instinct to herd. They are fun pets to have especially if you enjoy jogging, cycling, hiking and spending time outdoors and in the wilderness. The Appenzeller Sennenhund is a lively, agile and wonderful mid-sized dog which can reach a height of 19 to 22 inches at the shoulder, and has a long life expectancy of 12 to 15 years. This self-assured dog breed makes an excellent watchdog which cannot be bribed by intruders and is also very smart and easy to train and learn new tricks and commands. The dogs from this breed need a lot of exercise as they were bred to be cattle guards and herders, so it is not a good idea to adopt an Appenzeller Sennenhund if you live in a small apartment without a backyard, or if you are not ready to go on long daily walks and play and exercise with your pup. Otherwise, these confident dogs are loyal and loving dogs which will protect your family and home at all costs and will perform the tricks you have taught them happily and with enthusiasm. The Australian Cattle Dog is a highly intelligent, sturdy and pretty active mid-sized dog which was first developed to herd cattle in large ranches in Australia. It is a loyal and protective dog which will watch over you and your family but is also excellent in all dog sports as well as in other dog competitions. The dogs from this breed are usually 1’ 5” – 1’ 8” at the shoulder and weigh from 30 to 50 lbs. They have long lifespans of 12 to 15 years and are very energetic working dogs, so they are suitable pets for people who love being active and spending a lot of time outside. These dogs are often referred to as Velcro dogs because they develop a very strong attachment to their humans and like to be in very close contact with their favorite person all of the time. Despite the name, this beautiful medium sized dog breed was developed in the US during the Gold Rush. It has strong herding instincts and is very energetic, and will be at its happiest when it has a task to complete or a job to do. Its height at the shoulder is about 1’6” – 1’11”, and it will reach a weight of 40 to 66 lbs. in its adult years. The lifespan of the Aussie is 12 to 15 years, and like other livestock herding dogs is suitable for families who love playing, exercising and spending time outside. Without motivating daily mental and physical exercise, the dogs from this breed can easily get bored and even destructive. This amazing dog is a great pet for people who have large backyards or other outdoor open space where the pup can roam and spend its endless energy. 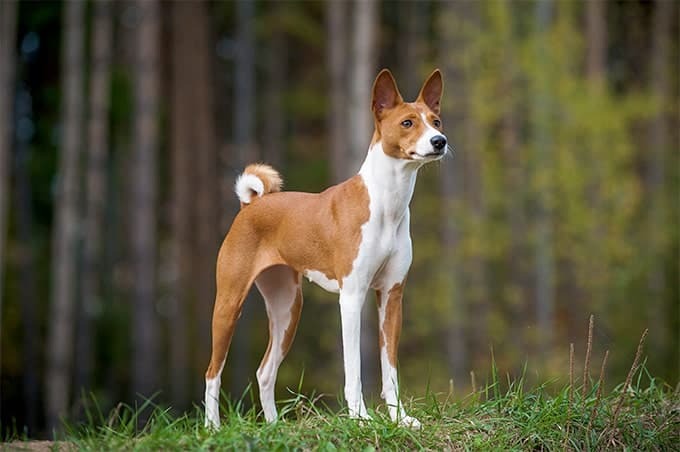 Basenjis originally come from Congo. They are rodent chasers and hunters for small prey and are pretty clever and endearing pups. The Basenji is 1’4” – 1’5” at the shoulder and weighs from 22 to 24 lbs. One of the most typical characteristics of this medium sized dog breed is that they do not bark, but rather make strange yodels and screaming sounds. Another unique feature of the dogs from this African breed is that they spend a lot of time grooming themselves like cats. Basenjis are charming and energetic dogs but can be quite stubborn and difficult to train. They are also skillful escape artists so you should have a secure physical or wireless dog fence and always keep an eye on your pet at all times if you want to prevent it from wandering off. The Basset Hound is such a charming dog, that it is very difficult to resist bending down to give it a nice scratch behind the ear or a kiss on the nose. These medium-sized dogs have the second best noses after their cousins the Bloodhounds and have extremely unique features which set them apart from all other dog breeds. The Basset Hound has long velvety ears, sad drooping eyes, wrinkled brows, and short but very powerful large-boned legs. Basset Hounds are only up to 15 inches tall at the shoulder but weigh from 40 to 65 lbs. and are very powerful pups. They are low key and patient dogs, but are also very stubborn and have a loud ringing bark especially when following a trail. Otherwise, they are mild and very agreeable when they are indoors and will enjoy snuggling beside you and napping when you decide to relax as well. The cutest and funniest of all animated dogs Snoopy is a Beagle, so it is pretty clear that Beagles are one of the sweetest, merry and funny medium sized dogs in the world. They are a bit stubborn and require a lot of training by a patient and consistent owner, but otherwise, these jolly dogs are the perfect loving pets. They were originally bred to track small game such as hare and rabbits, and will always enjoy following a new scent they smell along the way. They are still used for scent tracking and as working dogs at airports sniffing and looking for smugglers and contraband. Beagles are usually 1’1” – 1’3” at the shoulder and weigh from 18 to 30 lbs. These outgoing affectionate and loveable dogs are difficult to resist and will quickly become everybody’s favorites at home and outdoors at the dog park. This beautiful dog is a medium to large sized canine which was originally bred for herding, but today is commonly used as a service dog in the police the army and others. The Belgian Malinois is an excellent companion and guard dog for its family as well. The dogs from this breed are very athletic, smart and quite intense. They will grow to a height of 1’10” – 2’2” at the shoulder and weigh from 40 to 80 lbs. 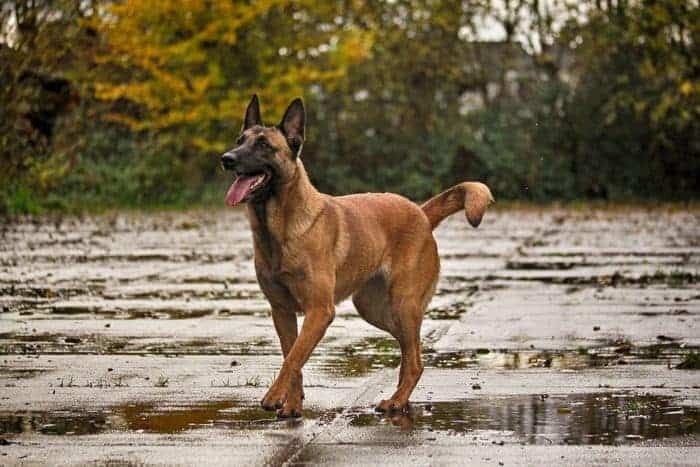 The Belgian Malinois truly enjoys learning and working and does very well in all sorts of agility and other competitions, as well as in rescue operations and at other tasks. They are eager learners but need to be socialized thoroughly from a young age, so they react normally to all kinds of people, animals, and different situations. They love playing, so be prepared to be spending a lot of time entertaining and exercising with your dog if you decide to adopt a Belgian Malinois. This breed gets its name from the hilly border between England and Scotland where it was first developed as a sheepherder and guardian dog. Border Collies have unlimited energy, working drive and stamina and are amazing herding canines, as well as excellent performers in all kinds of dog sports. The Border Collie is 1’6” – 1’10” at the shoulder and weighs 30-45 lbs. These masterful and attentive herders are a joy to watch, but they need to be given work and tasks to complete in order to feel happy and content. So, if you are ready to provide your dog with a lot of playtime, mental and physical exercise and entertainment, the Border Collie is the perfect medium dog breed to choose. Bred to be the perfect medium sized guard dogs, Boxers are one of the top preferred pets and companion dogs today. 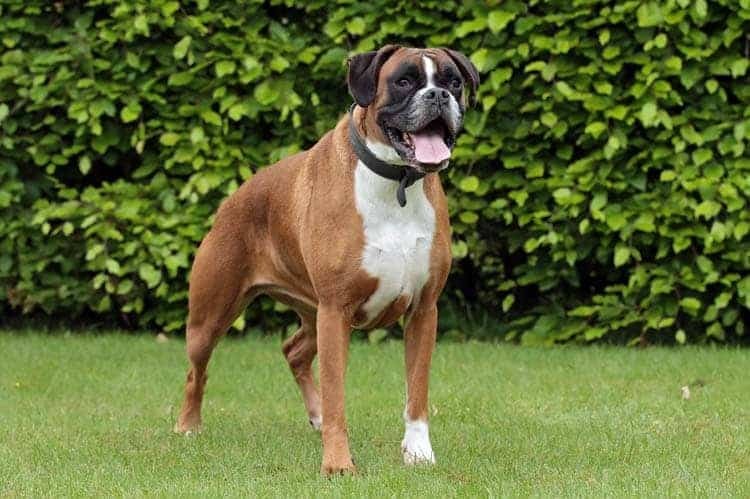 Boxers are usually about 1’9” – 2’ tall at the shoulder and weigh from 60 to 70 lbs. They are large and muscular dogs, but have mischievous eyes and love playing and even acting like clowns to please their owners. They take about 3 years to mature completely and are quite bouncy pups, which is why you should be careful when they interact with toddlers and small children. Otherwise, these friendly and smart pups are very loyal pets and can be perfect companions to all types of owners and families. Originally developed to be gundogs, Brittanys are pointing hunting dogs which can also be perfect family pets and canine companions. These sporting dogs reach a height at the shoulder of 17 to 20 inches and a weight of 30-40 lbs. They are elegant canines which can be quite hyperactive, but they are the perfect size to keep inside the house or to travel with, especially if you enjoy hunting. With extraordinary energy levels, these dogs do require extensive walks, runs,and exercise on a daily basis, so if you are a couch potato, the Brittany is definitely not the most suitable breed for you. The Bull terrier was first developed as a fighting dog breed, but later on, turned into a fashionable companion dog. Today, Bull Terriers are loving family pets and show dogs. They have highly recognizable egg-shaped heads, muscular and strong bodies and an average height at the shoulder of 1’9”-1’10”. They are very active and friendly dogs which often act like clowns but have amazing larger than life personalities. They like to stay active and stay entertained, and will not tolerate being left alone for long periods of time. Bull terriers do need to be socialized and trained from an early age so that their natural aggression towards other dogs is curbed and under control. Overall, your life with a Bull Terrier will be a true joyride and there will never be a dull moment again with a pet like this. These charming canines were first developed to be used for bullbaiting, but are perfectly gentle companions for both adults and children. Bulldogs are perfect pets for people who prefer spending more time lounging and relaxing at home. They do require daily walks but will be perfectly happy to spend the rest of the day napping and snoring next to you. They grow to a height of just about 1’ – 1’3” at the shoulder but can weigh from 40 to 50 lbs. They are muscular and highly recognizable dogs, with large eyes, short tails and a distinctive gait which looks more like a waddle. They are loving and affectionate dogs which will be happy to spend most of the time sleeping and snoring on your lap. Cocker Spaniels are absolutely beautiful medium sized dogs which require quite a lot of grooming. They are bird dogs by nature but today are more popular as family companions. These cheerful pups will enjoy playing with you and with your children and after that snuggling next to you and taking a well-deserved nap. The Cocker Spaniel is about 1’2”-1’3” at the shoulder and weighs from 24 to 28 lbs. These dogs are gorgeous looking, merry and eager to please dogs which will become your loyal companion and friend to all family members. Everybody knows Lassie, right? Collies are beautiful herding dogs originating from Scotland. They are incredibly loyal dogs which have the unique ability to foresee the needs of their owners. They are also great companion canines. Collies will grow to a shoulder height of 1’10”-2’2” and a weight of 50 to 70 lbs. One of the smartest dog breeds, Collies are very easy to train and are completely devoted to their families on their close circle of friends as well. They are also highly protective and will bark at strangers but overall they are not an aggressive breed. The Dalmatian is another highly recognizable breed. These athletic white dogs with black spots are highly versatile canines. Dalmatians still serve in fire stations, in circuses as well as for hunting. These dogs can be gallant in one moment and act goofy in the next, so they are a pure joy to have as companions and pets. Dalmatians are usually about 1’7” – 2’ tall at the shoulder and weigh about 48-55 lbs. They are absolutely beautiful dogs but they also have extremely high energy levels which can be quite exhausting for owners who are not so active and are not prepared to deal with this type of energy. English Cockers like the American Cocker Spaniels are sweet, happy middle sized hunting dogs with silky long ears and beautiful little faces. These dogs are perfect companion dogs for owners who can provide them with the daily exercise they require. They are relatively small and reach a height of just 1’3” – 1’5” at the shoulder and reach a weight of 26 to 34 lbs. English Cocker Spaniels are happy little fellows which are quite sturdy and energetic too. They do need obedience training as they tend to be quite stubborn, but otherwise, are loyal and fun companions to have. The English Setter is a beautiful and aristocratic bird hunting dog breed which was specifically developed to stand in a traditional Pointer style and to “set” or crouch low when it spots birds. While Setters are still one of the most popular hunting breeds, they are also commonly adopted as family dogs and companions. They are on the taller side and reach a shoulder height of about 1’11” to 2’3” and a weight of 45 to 80 lbs. These graceful dogs are easy going, gentle and very devoted to their families. The English Setter is a perfect choice for first-time dog owners as they are easy to train, obedient and are also perfect watchdogs, and yet are friendly to guests they have been introduced to. The English Springer Spaniel is a gun dog developed to spring at game, but today it is also a popular companion dog. Dogs from this breed are perfect pets for families or owners who love hiking, camping, and other outdoor activities. They are agile and highly energetic dogs which reach a height at the shoulder of about 1’6” to 1’10” and a weight of 45-55 lbs. They need a lot of exercise, but need to be kept in a safely fenced yard or on a leash in order to prevent them from running off to hunt by themselves. English Springer Spaniels are excellent athletes and do well in all sorts of dog sports and contests. They are also suitable for therapy dogs as they are loving and gentle pups. The German Wirehaired Pointers are enthusiastic, eager and affectionate dogs which reach a height of about 22 to 26 inches and a weight of about 50 to 70 lbs. They are sturdy and versatile gundogs that love the outdoors. At home, your German Wirehaired Pointer will be an amusing and loving family member as well. Their harsh wired coats protect these dogs from getting injured when running through bushes as well as from bad weather. They have cute beards and eyebrows which give them amazingly smart expressions. These dogs are highly energetic and are suitable for active owners as well as for owners with previous experience with dog training and dog care. This is an agile, powerful and very graceful medium dog breed which is highly admired for its inborn intelligence and beauty. Even though German Pinschers were originally developed to hunt and kill rodents, they are also excellent guard dogs as well as loving family pets. The dogs from this breed will grow to a height at the shoulder of 1’5” to 1’8”, and will weigh about 25 to 45 lbs. These dogs are very energetic but they also just love being with their human families too. You may notice that your German Pinscher is smiling at you even after it has devoured yet another rubber toy. The fact is, these canines retain their puppy-like playfulness even as they age, so you will have a playful and loving companion for a long time with a German Pinscher at home. The Irish Terrier is a gentle and yet dashing dog breed which requires little maintenance. The Irish Terrier is typically about 18 inches high at the shoulders and can weigh about 25 to 27 lbs. Often called the “daredevils” of Ireland, these courageous terriers are hard workers but gentle and loving at home when resting. They have recognizable fiery red coats and beautifully balanced bodies and long legs which make them one of the most graceful and elegant of all the terrier breeds. Labs are the most popular dog breed in the US and have held this top position for over two decades. They are about 21.5 to 24.5 inches high at the shoulders and weigh about 55 to 80 lbs. People love Labrador retrievers for a variety of reasons. First, they are very friendly, outgoing and merry dogs which are very affectionate and devoted to their families. They have dense coats which come in yellow, chocolate or black colors and have happy otter tails which will never stop wagging. They are athletic and energetic dogs which need a lot of exercise to remain happy and physically fit. No doubt, the Lab is a suitable pet for just about any family or owner, which is why it is at the number one position when it comes to popularity! The job of the Pointer is to “point” at birds during hunting, but they are excellent loyal and mild tempered companions as well. Pointers are very gracious and elegant canines which are about 23 to 28 inches high at the shoulders and weigh about 45 to 75 lbs. These dogs are amazingly fast and agile and are excellent running partners if running is your thing. They come in all kinds of colors and are beautiful and intelligent dogs which will fit in perfectly with active families. The Poodle comes in standard, miniature and toy sizes. The standard sized Poodle will reach a height of about 1’10” or more, and a weight of 45 to 70 lbs. Poodles may look like pampered show dogs which spend their days on silk cushions, but the truth is that the Poodle is one of the most intelligent dog breeds and has many talents. Poodles were originally bred as water retrievers for ducks and other waterfowl. These elegant and regal dogs are among the fastest learners in the canine world. They are playful and yet dignified dogs which are very good at all kinds of dog sports and contests. They are perfect pets for both experienced and for first-time dog owners but do not like to spend a lot of time alone. These adventurous and athletic medium sized dogs are among the best swimmers when it comes to dogs. They even have webbed feet which helps them swim faster and further. The Portuguese Water Dog breed became especially popular after President Obama introduced his first dog Bo. These beautiful swimmers are about 17 to 23 inches high at the shoulder and weigh 35 to 60 lbs. They are eager and energetic dogs and excellent companions if you share their passion for movement, swimming, and outdoor activities. At home, they are calm, intelligent and obedient dogs which can adapt to any type of home and family. These ever smiling dogs are strikingly beautiful and their close resemblance to young polar bears makes them totally irresistible to hugging and petting especially when they are still young puppies. They were bred to withstand the freezing temperatures and snow in Siberia, and are sturdy and strong-willed animals, but also gentle, devoted and friendly family pets and companions. They simply love their humans and will happily play with the children all day long. They have extremely thick coats which shed heavily in the spring and will usually reach a height at the shoulder of 1’7” to 2’ and a weight of 50 to 60 lbs. They do require serious grooming but are smart and friendly animals, which need to be kept physically and mentally active and trained in order to stay away from boredom which can cause them to resort to destructive and annoying behavior. The Standard Schnauzer was developed to be a ratter and a guard dog in German farms. These attractive medium sized dogs are pretty versatile and are loving companions which will protect you and your family and will keep you entertained at all times. They are about 1’5” to 1’8” tall at the shoulders and can weigh somewhere between 30 and 50 lbs. The Standard Schnauzer is the original breed which inspired the development of the giant and the miniature Schnauzer breeds too. They shed little and have minimal dog odor which makes them perfect pets for people with dog allergies and similar sensitivities. Standard Schnauzers are fast learners and are eager to please, so they are suitable for all types of owners and families. Shar-Pei dogs are absolutely unique and can never be mistaken for another dog breed. This is one of the oldest dog breeds and was used for hunting, guarding, herding and even fighting throughout the centuries. Shar-Peis have wrinkly skin and skin folds on their entire bodies and bristle-like coats, powerful heads, blue tongues, and curled tails. They are calm indoors so they are suitable for apartment dwelling, but are also pretty independent and protective of their families and homes. The dogs from this ancient Chinese breed are usually about 1’6 to 1’8 inches high at the shoulders and weigh from 40 to 55 lbs. One of the six native Japanese canine breeds, the Shiba Inu was first developed to chase birds and game as well as for hunting larger animals such as wild boars. Today, Shiba Inus are popular companion dogs which reach a shoulder height of about 1’1”-1’5” and a weight of 17 to 23 lbs. They look like plush fox toys with their squinty eyes, soft fur and prick ears. Overall, the dogs from this Japanese breed are friendly, alert and good-natured animals, but can be stubborn and thus are not the easiest dogs to train. They are fast and alert dogs which are quite smart but have minds of their own, so you may want to adopt a dog from this breed only if you are experienced or confident enough to properly train it. The Siberian Husky is one of the most beautiful medium dog breeds. These dogs have beautiful soft coats and very recognizable face masks and blue or multi-colored eyes. They are very energetic and athletic dogs, and even though they are very intelligent they can be a handful for first-time owners due to their independence and their ability to escape through even the most secure fences. Huskies are about 1’8 to 1’11” tall at the shoulders and weigh from 35 to 60 lbs. They were originally developed to pull sleds in Siberia and are really remarkable looking dogs. Unfortunately, they are one of the leading dog breeds which end up in shelters because people who are not familiar with this breed tend to underestimate their independence, energy levels and their lack of eagerness to please or show their affection to their humans. The dogs from this popular terrier breed are known for their happy temperaments, friendliness and their strong devotion to their humans. They have remarkable wheaten coats but thankfully for their owners are low shedders. These medium-sized terriers originating from Ireland grow to a height at the shoulder of 19 inches and a weight of up to 40 lbs. With their silky and wavy coats and their unique peek-a-boo hairstyles, they do require brushing every other day and regular grooming. They are friendly and loving dogs but have strong prey drive instincts which can cause them to run off after just about anything that is moving, so make sure that you have a reliable fence or keep your Soft Coated Wheaten Terrier on a leash at all times. Spanish Water Dogs are about 16 to 20 inches high at the shoulders and weigh from 30 to 49 lbs. They are highly intelligent canines with a strong working drive and need to be kept active – both mentally and physically at all times. Their beautiful curly and wool-like coats do need regular grooming and clipping too. Dogs from this medium-sized breed are often used as working dogs for detection of drugs, bomb detection, search and rescue operations, therapy work, water sports, herding and for competitive agility. They are very energetic and agile dogs which are not suitable for first time owners or owners who are not confident enough to establish themselves as pack leaders. These dogs are a good option for people who are highly active themselves. Once such a relationship has been established, the Spanish Water Dog will become a loving, loyal and devoted family dog and companion. Developed in Hungary, this elegant dog breed has an aristocratic figure and attitude and is a loving pet which requires a lot of attention and exercise. The Vizsla is usually about 1’9” to 2” tall at the shoulders and weighs from 45 to 65 lbs. These affectionate medium sized dogs get incredibly strongly attached to their people and always want to be by their side. The breed was originally developed for pointing and retrieving but will always stay close to you no matter whether you are hunting or just enjoying a walk or run outside. The Vizslas are superb jogging, running or cycling buddies and will love you forever if you manage to satisfy their craving for exercise and for attention. These stunningly gorgeous dogs will no doubt capture everybody’s attention when you go outside on a walk. The “silver ghosts” as they are also known were developed in Germany as gundogs for large game like deer and boar. Today, they are among the most popular medium dog breed around the world. They do need extensive daily exercise but are loving and devoted family pets when they are home. The Weimaraner is typically from 1’11” up to 2’3” tall at the shoulders and weighs 55-85 lbs. The dogs from this beautiful breed are courageous, intelligent and loving dogs, but can be a handful due to their high energy level and stamina, and to the fact that they can get into trouble when their demands for physical and mental activity is not met. These dogs were developed as gundogs in Wales which were used to flush or spring on game. This medium sized dog breed is yet another highly energetic breed which requires a lot of daily exercise. The Welsh Springer Spaniel is usually from 1’5” to 1’7” inches tall, and weighs from 35 to 55 lbs. The dogs from this breed have unique silky white and dark red coats with feathering around the ears, belly, chest, and legs. They are easy to train and always eager to please their humans but are also quite independent. They are very devoted to all family members but can be timid are reserved to strangers which is why socializing from an early age is a must for dogs from this breed. The Whippet is a loving companion dog and is usually one of the top contenders for the prizes at various dog sports and agility contests. These elegant hound dogs are about 1’6” to 1’10” high at the shoulders and weigh from 18 to 48 lbs. These elegant and fast dogs were originally developed to chase rabbits and other small game. Today these sleek and beautiful dogs are preferred as family pets because of their gentle and affectionate nature. Early socialization of the Whippet is a must if you want to avoid your dog becoming fearful from people, other dogs and from different situations. Whippets do need daily walks and playtime, but it is a good idea to never let them go from their leashes because they have strong chasing instincts and can run off at any time. The Wire Fox Terrier is another very recognizable medium dog breed. The dogs from this terrier breed are highly alert and gregarious. They usually grow to a height of no more than 15 and a half inches at the shoulders and weigh up to 18 lbs. They were developed in Britain to serve as foxhounds, but today they can mostly be seen at the prestigious dog shows and with their families enjoying together time. They are energetic dogs with rough and wiry coats and V-shaped ears which are cutely folded down. They do not shed a lot but their coats do require to be hand stripped and clipped pretty regularly. They are excellent pets but are highly energetic and have strong hunting instincts so you will have to keep your Wire Fox terrier entertained at all times if you want both the dog and you to be happy. This is a hardworking medium dog breed which is also known as the superior gundog breed. The Wirehaired Pointing Griffons have lively natures and are fun dogs to be around especially if you are an active person and lead an active lifestyle. The dogs from this breed reach a height at the shoulder no taller than 2 feet, and a weight of 50 to 60 lbs. They are still among the top preferred hunting dog breeds due to their ability to point and retrieve game. They are also pretty alert guard dogs but do get along with all family members including children and other pets if socialized properly from an early age. They are a non-shedding breed but will feel much better in a house with a yard or in the countryside, rather than in an apartment in the middle of a busy city. So, hopefully, with this extensive list of the most popular and not-so-popular medium dog breeds, you were able to choose the perfect four-legged pal to add to your family. Not too small and not too large, these dogs are perfect for all kinds of homes – big or small, and can easily travel with you as well. Always do your research about a particular dog breed before proceeding to adopt a new pup in order to be satisfied with your choice and to ensure that you are getting the most suitable dog for your type of family, your lifestyle and your needs and expectations. Also, it is always a good idea to check your local rescues and shelters for any medium sized dogs which are up for adoption before going to a breeder or shop and purchasing a pup. Good luck and enjoy your new mid-sized best friend!